The Indian used automobile market continues to grow exponentially. Trust is the main factor that hinders a transaction between two unknown people. By launching ECO in association with Carnation, Droom is meant to increase the transparency and trust in each automobile transaction that happens online or offline. ECO is India’s most advanced, independent, objective and unbiased auto inspection and verification service provider. The app offers comprehensive inspection checklist, which is mutually exclusive and collectively exhaustive covering all the important points required for verifying or inspecting a vehicle. An inspection technician or ECO ninja will deliver doorstep service at your convenience using ECO’s proprietary methodology. Also users will be provided with a digital report after the completion of the service. “Unlike US, Western Europe and Japan, India is low trust market in general and buyers for used automobiles suffer from information asymmetry and moral hazard. In India, buying a used automobile is full of pain points, hassles and pitfall. 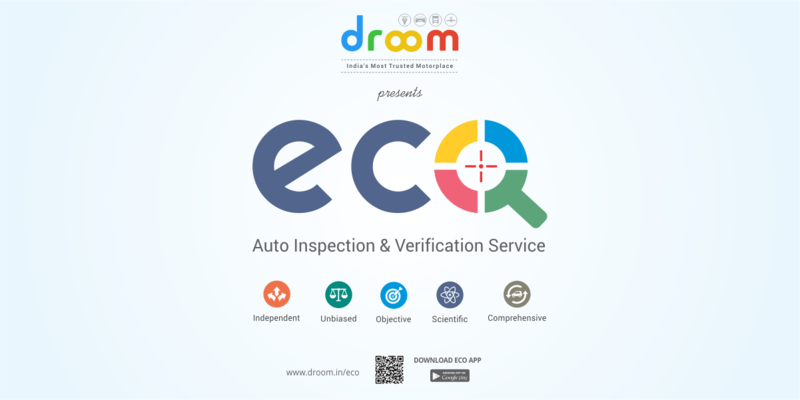 With Eco launch, Droom has deepened its commitment to increase trust and transparency for used automobile transactions in India. Eco is India’s most scientific, comprehensive objective and unbiased Automobile Inspection and verification service. We are very excited to have Carnation as our partner for Eco as it is very complementary with Carnation experts around the nation now using the most scientific and powerful tool to protect buyers’ interest.”, said, Sandeep Agarwal, CEO and Founder, Droom. ECO is a great solution for automobile buyers and sellers. Using this app, anyone can easily order vehicle inspection and verification at the convenience of place and time. An independent and unbiased inspection/verification report for any used bike or car will give buyer a confidence to trust and lock the deal. Also Droom’s partnership with Carnation also allows ECO users to access Carnation’s extensive network of workshops and skilled technicians. In this oh-so-busy times, ECO is a wonderful solution, offering great service within budget and comfort. Before you sell or buy your used car or bike make sure to use ECO auto inspection app. Download ECO app now from Google Play Store, and get ability to schedule comprehensive automobile inspections from highly trained and certified professionals – called Ninjas.